most widely consumed psychoactive drug. Unlike many other psychoactive substances, it is legal and unregulated in nearly all parts of the world. Caffeine is in a group of nootropics that sharpen your mind. Caffeine’s main effect on the body is an increased temporary sense of alertness and wakefulness, due to causing nerve cells in the brain and body to fire faster but it can also cause undesirable effects such as; headaches, jitters and shakes, disrupted sleep, insomnia, nervousness, dependency, high blood pressure, dehydration, fast or uneven heartbeat, dizziness, stomach upset, diarrhoea, and muscle tremors . It takes around 1 hour for caffeine to reach it’s peak level in the bloodstream once consumed, and remains there for 4-6 hours, increasing the release of acid in the stomach, which can lead to compromised digestion or even heartburn. Most of us have heard of dopamine the ‘reward chemical’ in the brain, though not quite what we think it to be, it is involved in the anticipation of reward, which takes place in the Mesolimbic pathway also known as the ‘reward pathway’, where dopamine acts on the D2 receptors, dopamine is what creates the feeling of enjoyment for that stimulus. It helps to ‘glue’ the connections. Dopamine also regulates motor control, attention and even breast milk production. With fewer D2 receptors in the thalamus ( that is responsible for higher thinking and reasoning) there may be less signal ‘filtering’ occurring resulting in more unusual connections being formed and more ‘out of the box thinking’. Unfortunately a lack of D2 receptors in the thalamus is also (some studies suggest) correlated with an increased chance of developing schizophrenia. Adenosine is a substance (purine nucleoside) that the brain produces as neurons fire. It is accumulated through the day and slows down when we are tired and sleepy. Caffeine blocks this process by mimicking adenosine. Making the brain feel awake and alert, renders adenosine inert. It’s like a break that slows down the engine, to stop tiredness and brain fog, but over a period of time if you constantly block adenosine, you can be feeling the accumulative effects of caffeine which can interfere with sleep cycles, this in turn impacts daytime alertness and performance. So it becomes counterproductive if using caffeine as a crutch to increase energy and alertness, especially after a bad nights sleep. This reliance on short term energy can lead to long term fatigue and brain fog as a result of blocking A1 receptors. When you block the A1 receptors, this results in the neurons throughout the brain firing much more regularly and rapidly. To the brain this suggests something important is going on, so it responds by releasing more neurotransmitters – specifically stimulants (Glutamate) an ‘excitatory’ neurotransmitter which plays an important role in ‘long-term potentiation.’ The meaning being that glutamate increases the strength of simultaneously firing neurons. If they fire Independently that can trigger others. Excessive amounts of caffeine stimulate the adrenal gland, which means that every time you consume caffeine, you’re activating the body’s fight or flight response. But instead of releasing adrenaline so the body can react to a true stressor, the adrenals are releasing this hormone in response to your caffeine consumption. The adrenals function to produce hormones essential to life. The adrenal medulla is the inner portion of the adrenal gland and produces cortisol, estrogen, progesterone and testosterone. Sustained adrenal stimulation from caffeine results in chronic high levels of cortisol. Cortisol (also known as the stress hormone) that gets activated when adrenaline is released which in turn releases insulin, using up blood sugar, which is stored as fat, and stimulates hunger for quick fix snacks. Consistent high levels of cortisol also breaks down healthy bone and muscle; this slows down cellular healing and interferes with digestion and mental function. Cortisol regulates other hormones, balances metabolism and manages immune function and when cortisol is released, due to caffeine, Serotonin, the mood regulator (also referred to as the ‘feel good hormone’ ) increases as a counterbalance. But altering brain chemistry is worth serious consideration as neurotransmitters do not exist in a vacuum and there is bound to be a knock on effect along with the withdrawal symptoms. Many of us have developed a dependency on starting the day with caffeine; possibly the worst time to do so as cortisol levels are highest in our systems in the mornings. High levels of released cortisol elevates heart rate and blood pressure. This constant state of fight or flight stress response, depletes energy reserves, pushing the adrenal glands to extremes, which leads to fatigue, anxiety, insomnia and weight gain. According to Dr Lawrence Wilson(1) an expert on adrenal burnout; chronically pushing the adrenal glands with caffeine puts them into slow decline, which ultimately leads to fatigue. 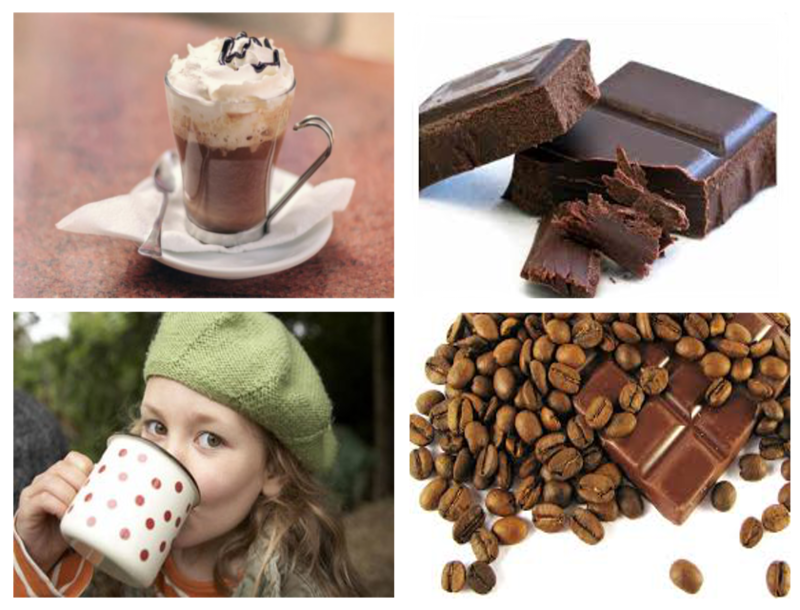 Caffeine interrupts the body’s natural cortisol rythm placing it in a constant state of emergency. This in turn depletes adrenal reserves forcing the adrenals into survival mode. This is a bit like going overdrawn on your body bank creating false energy which constantly stimulates, leading to physical bankruptcy. In particular, children who are more sensitive easily stimulated and are challenged at bedtimes to settle off to sleep, it’s worth reconsidering the use of chocolate as a reward to calm down hyperactive behaviour. Try organic carob, which tastes just as great as chocolate bars, but without the caffeine and is packed full of vitamins, minerals, healthy fibre and Polyphenols without the stimulating effects of chocolate. Going cold turkey isn’t that bad after all.